Nope. The boy didn't hear it in time, and as a result, Ayu's debut scene was hindered by a run-and-fall (won't be the last time they meet this way). She was running away from someone: the taiyaki seller. In a very serious tone, she explains that she couldn't help herself when she bought some (she was hungry) but then realized she had no money. Her childlike mind doesn't think to take off her backpack when asked to look at it, instead spinning round and round in a futile chase. 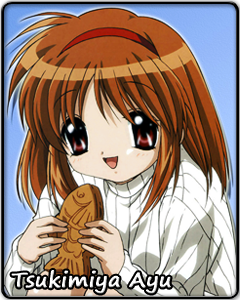 Ayu is famous for her love of taiyaki and her "Uguu~" catchphrase.